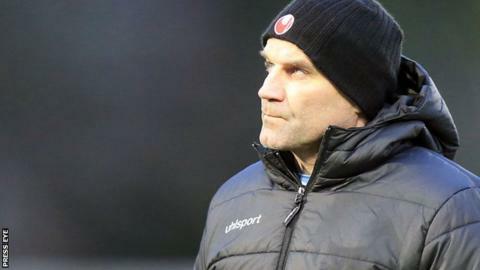 Ballymena United have axed Glenn Ferguson as their manager after a run of five straight league defeats. The former Linfield striker was named Sky Blues boss in 2011 and twice guided the club to Co Antrim Shield success during his reign at the Showgrounds. United are ninth in the Premiership and just seven points clear of bottom spot. "The club felt a change was needed to freshen up the team after getting dangerously close to the relegation zone," said United on Monday night. Ferguson also took Ballymena to the Irish Cup final in 2014 and last season's League Cup decider. United beat Linfield to win the Co Antrim Shield two months ago but Ferguson has failed to make the team a force in the league and he departs after Saturday's 4-2 home defeat by Dungannon. The Warden Street club has terminated Ferguson's contract with immediate effect and he leaves with coaches Lee Doherty and Norman Kelly. "The board of directors felt it was time for a change because success in the knockout competitions hasn't been replicated in the Danske Bank Premiership," Ballymena added. "We thank Glenn for his service to the club and for what he achieved and we wish him well for the future."